Logins this hour: 7568 ? 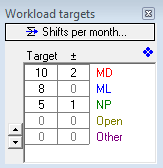 Workload Targets let you set a number of shift/hour targets for staff. Assign the Autoscheduler to fill based on targets. Or, when manually filling your schedule, be flagged when staff are below or over set target. Assign the target to staff type instead of per staff member. Click Window in the menu bar and then select Workload targets.... 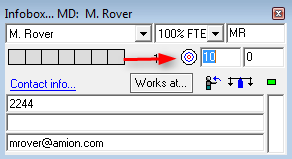 In the Workload target window under the Target column, click the cell you wish to set a staff type target. Click the up and down arrows to set the number of shifts/hours per staff type. If there is wiggle room with the target, set the +- of the number of shift/hours the staff type may go over or be under. For example: If MD has a target load of 10 shifts a month with a 2 variance, the Target for MD would be set for 10 and the +- would be set as 2. Click the Work Preference icon in the toolbar above. In the Infobox window is a bulls-eye target icon and two text field boxes to the right. The first field is designated for monthly (or custom date range) target. The second field is for an annual target. Use the annual target when monthly targets vary but should add up to a fixed goal by year's end. Enter a target number of shifts/hours in the appropriate field. Create advanced Target rules. Click here to learn more. Targets by default are set by number of shifts worked. To switch targets to number of hours, click the View & Tally icon in toolbar above. The default target range is monthly or your custom schedule date range. To scale the targets to a different range, go to the File / Preferences / Call tallies, 2. Check the box Target workloads are based on.. and set the number of days to scale to schedule. Click OK once finished to close the Preference window. If manually building your schedule, targets are visible in the Infobox staffing list. Click the sigma icon in Infobox toolbar to enable viewing call tallies. Staff with targets will have two numbers separated by a / icon. The first number is the number of shifts/hours scheduled for schedule date range. The second number after the / is the target. Staff that are under target by 2 or more, green boxes appear above tally. Staff within +-2 of target, boxes appear black. Staff over target by 2 or more, boxes appear red. 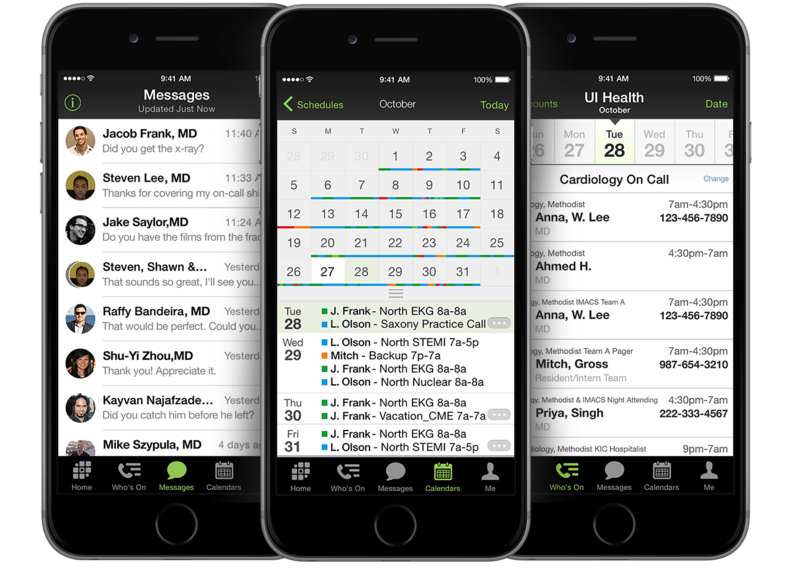 OnCall keeps the targets established indefinitely. If targets change each month, adjust them before you begin scheduling. If you let your staff decide their target load each month, enable them to submit the number they desire online via Amion's Special Request page. Click here to learn more.